Yup, this freakish Photoshop Frankenstein has been released as a Public Service to spread the joy of Holiday Guilt to the youngsters of our country and to promote awareness of the plight of turkeys everywhere. 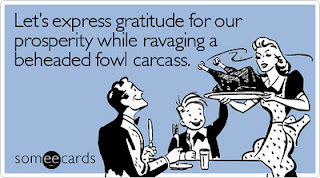 Thankful yet? Look, PETA, I'll just come out and say it. You've become like the well-meaning but certifiably insane doddering grandfather who comes to the family Christmas gathering with a wrapped giftbox containing a tube of toothpaste, a half-eaten sandwich in a plastic baggie, and a can of Deep Woods OFF; we get where you're coming from, it's technically a thoughtful and practical gift, but your presentation clearly indicates that it's time to have you confined to a home. Plus, I hate to be the one to break this to you PETA, but the average kid sees exactly zero connection between his adorable, beloved family pet and the ugliest feathered creature ever to ooze out of God's imagination. (You should have gone with the "turkeys are too ugly to eat" angle; I might have agreed with you there. 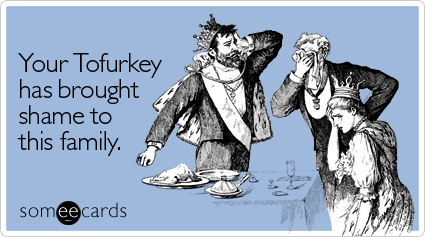 Then my family could have just had ham instead.) So saying you shouldn't eat a turkey because you wouldn't eat your dog is like saying you shouldn't eat cookies because you wouldn't eat lima beans slathered in non-toxic Tacky Glue. Sure, technically these things all fall under the broad category of "Stuff That Won't Kill You If Ingested," but let's not underestimate the importance of filing things under the subcategories "Delicious" and "That's Disgusting." Also, I couldn't help but notice that they urge, "Go vegan." They do know what "vegan" means, don't they? The ad doesn't say, "If you wouldn't eat your dog, then for God's sake put down the glass of milk," does it? I just think it would've been smart to introduce an intermediate step like vegetarianism if your angle is to get kids to give up their delicious, succulent Thanksgiving feast. That's all. Vegetarianism is already a pretty tough sell on it's own without trying to sneak in veganism. PETA: No kid, you can't eat turkey this year. Have a salad! Kid: Well, okay, I guess... At least I can hide the lettuce under a mountain of cheese and ranch dressing. PETA: Oh yeah, about that - negative on the dairy, too. PETA: Uh huh. And also, no chicken nuggets. Or mac-n-cheese. Or hot dogs. Concerned Mother: But that's all he'll eat! He'll starve! 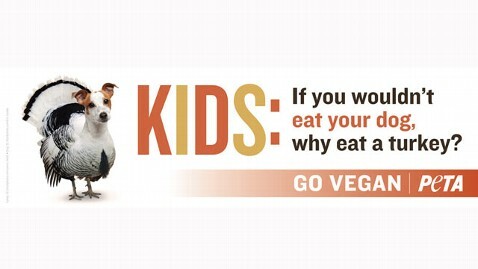 PETA: Your child will need to adapt to life with a ketchup-only diet, ma'am. I'd also like to point out that most people, including your most rabid members of PETA, would eat a dog, if they absolutely had no other choice. (To all you sensitive-types out there, I'm sorry I had to say that, but PETA forced my hand.) I'm not saying it would be your first choice, or even your third choice unless the other options were something like grubs or a McRib. But eventually, if your airplane had crashed in the Himalayas without a single Taco Bell as far as the eye could see, and you were stranded for weeks on end with nothing to eat but glaciers, and there was a dog there who was always crackin' wise about your mama and was suspected of plotting to kill you, you'd consider eating him. So sorry, PETA people, we're all omnivores, whether you like it or not. Don't get me wrong, I actually agree with veganism - no doubt many animals raised for food are treated badly, and in some cases the industrial practice is environmentally damaging. Nobody likes that idea. And committing to vegetarianism became even easier on Tuesday last week, when the geniuses in Congress decided pizza is a vegetable. The only question is, how desperate do you have to be before you'll toss aside the ideals and grill up a juicy, delicious hamburger? It's possible that the only difference between me and that lady picketing outside the local KFC is where we fall on the Starvation/Morals Threshold; deep down we're both vegans, I just don't have to be as hungry as her before I'll resort to eating a turkey. Labels: animals, culture, food, holidays, What did you say? That was as coherent as could be expected from someone obviously suffering from protein deficiency due to her secret veganism. I'm a vegan too, as long as that means I eat what I damn well please. My ancestors fought for eons to get me to the top of the food chain, and it'll be a cold day in heck before I abdicate that spot. I especially liked the "cracking wise" remark. Yep. That dog was just BEGGING (pun) to be eaten.